At February’s Ag Employer Seminar, UCCE Farm Advisor Franz Neiderholzer discussed several UCCE publications helpful to growers working to improve irrigation efficiency. Below are the discussed titles, with links for online purchase ($20-$25). For questions on the titles listed below, contact Franz Niederholzer at (530) 822-7515. 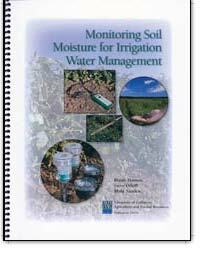 Monitoring soil moisture is an alternate method to water-based balance methods of managing irrigation water. Using this method you can “see” what is going on in the soil and determine answers to some key irrigation management questions. •Did enough water infiltrate the soil? •Is too much water being applied? •What is the water uptake pattern of the roots? •When should irrigation take place? •What was the depth reached by the irrigation? Includes 24 figures and 7 tables, metric conversions, and an appendix of typical root depths. This handy publication discusses the maintenance issues of microirrigation systems that can be used on tree crops, row crops, and trees and vines. Chapters include an overview of maintenance needs, monitoring and water assessment, causes and prevention of clogging, flushing and safety concerns. Also includes methods of preventing root intrusion, soil ingestion, bacterial growth, and backflow contamination. 2009 winner of a "Blue Ribbon" award for excellence in educational publications from the American Society of Agricultural and Biological Engineers. Getting maximum output for every energy dollar spent is the primary objective in operating an irrigation pumping plant. 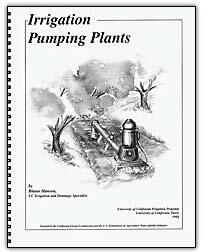 This manual answers growers' most frequent questions about irrigation pumping plants. Here you'll find everything you need from the basics of how different pumps work to detailed information about pump design, motors vs. engines, performance tests, troubleshooting, and maintenance. This handbook has been developed to bridge the gap between the advanced salinity literature and practical information on salinity intended for lay audiences. A user-friendly resource for agricultural consultants and advisors, as well as for local, state and federal agricultural and water agency management staff. 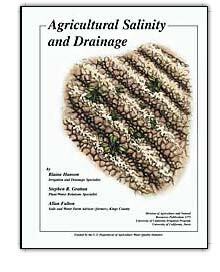 Includes thirty-eight chapters covering a broad spectrum of salinity and drainiage topics, written so as to be easily understood by anyone with a general agricultural background. Also includes appendices presented as a shorthand guide to assessing soil salinity and to determining the suitability of a given water for irrigation. Illustrated with 27 tables and 44 figures.